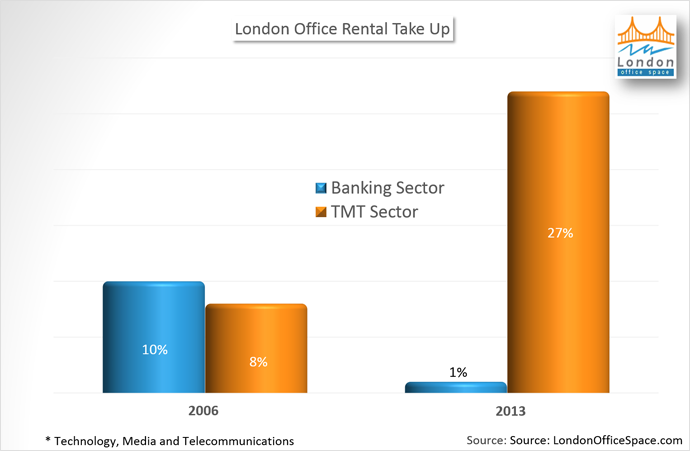 2013 was predicted to see growth in many areas of real estate, including office rental in London. Indeed, it turned out to be a year which exceeded predictions: Savills Estate Agency describe several points which appear to indicate that the office market in London has since passed the recovery stage and is settled firmly into a growth phase. For the second year in a row, leasing activity in London's office rental market increased, with a growth of 53% of rental of office space since 2012. Investment in London City's office rental market reached over £12 billion in 2013, according to Savills, the highest rate ever seen. This was mainly due to a return of confidence in some of the City's major businesses, particularly those in the field of technology, media and telecommunications (TMT). Indeed, it can clearly be seen that the trend in businesses which rent office space in London City has changed dramatically in the years since the beginning of the global financial crisis. For example, while the banking sector traditionally accounted for 10% of rental (figures taken from 2006), in 2013 they were involved in only 1% of City office lettings. TMT companies such as Amazon.co.uk rose from accounting for only 8% of London office space in 2006 to a massive 27% take-up in 2013. It is thought that 2014 will see a sharp increase in capital values over the first quarter. However, structural changes are bound to be seen as online retail sales become increasingly popular with businesses: and so many of these may look at distribution and delivery times when choosing urban facilities. 2013 was a year of exceeded expectations. The UK economy recovered monumentally, rising from being one of the world's straggler economies to one of the strongest between the months of January and December. This growth curve is expected to remain, with 2014 predicted to be one of the strongest years since 2007, with average earnings thought to outstrip inflation, a first since 2009. These figures point firmly towards one idea: London is seeing economic and social growth. With a predicted increase in population from 8.4 million in 2013 to 9.2 million in 2023, there comes an increase in office-based workers, and therefore requirements for increased office rentals in the City. This is particularly true as it is believed that those industries currently leading the employment boom in the city - TMT and financial sectors - will continue to expand over the next five years, with Oxford Economics predicting roughly 82,000 more office-based jobs in London city. Despite these figures, there is one final question remaining for London's office rental market in 2014: has the office space investment market overtaken the leasing market. While 2013 was undoubtedly a good year in the office rental market, there was also a record-breaking level of transactional activity. 2014's developmental market looks above average, with completions of new developments and refurbishments at 4.7 m sq ft. Less than a third of these predicted to be completed in 2014 have been pre-let. However, only 40% of those not pre-let are new developments. Prime yields in 2013 are below average, and the question of whether non-domestic investors will remain firmly invested in London's office rental market is yet to be answered for 2014. The majority of investors in office properties in London city are from non-domestic purchasers (70% of investors in the past four years compared to 45% in the early 2000s, according to Savills). In fact, 2013 saw 91% of its investments in the office markets (including those purchases which were over £100 million) from foreign investors, while only 22% of investors were UK based. However, a third of those investments which were in the range of £100 million were from UK investors. Deloitte Real Estate predicts that while these overseas buyers will remain important investors, many private equity investors will view the growing market favourably, and invest in new opportunities, many of which may have increased leasing risk: for example, offices in business parks and in key regional centres. Many of these new purchases may be outside London City, and therefore Deloitte forecast that in many regional sectors may outstrip London City in terms of market performance for some part of 2014. Along with office rental take-up rising to its highest level in London City since 2010 (rising by 45%, according to Savills), vacancy rates of office space fell to a low of 6% in 2013. Predictions for 2014 forecast that while take-up may be slightly reduced compared to last year, vacancy rate should remain stable and average rental prices should increase by 3-6% over the next 5 years. Investor rates are believed to remain stable also throughout 2014, while prime yields are predicted to increase by 25 bps by the end of 2014.